For simplicity here the directions for individual miters are reduced to just the specifics. Note: Slip first stitch every row. Center panels back and front are knit the same: Cast on 60+1stitch to make mitered diamond #1. Knit every row, alternating two contrasting yarns. For triangle #2 pick up 30+1 stitches on the edge of first diamond. Knit every row, alternating yarns, and at the end of the rows on the right side decrease K2tog, K1. After triangle is decreased to last stitch, break yarn. For triangle #3, pick up 30+1 stitches along other edge of diamond #1. Knit every row and alternate yarns. At the beginning of right side rows, K1, k2tog, k to end. Diamond #4 is the same as #1 and the stitches are picked up from the previous three modules. #5 and #6 are the same as #2 and #3. 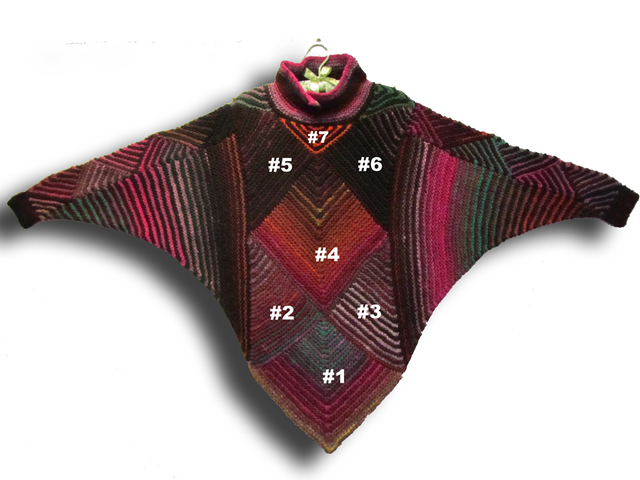 Neck Triangle #7: Pick up 30 stitches from between triangles #5 and #6. Make triangle: Right side only: K1,k2tog, knit to center three stitches, make decrease, knit to last three stitches, k2tog, k1. Make back panel the same as front panel. Join front and back panels with triangles made the same way as triangle #7. The center sleeve panel is based on a diamond of 30 +1 stitches and triangles of 16 stitches picked up on the edges of the diamonds. The diamonds # 1,4,and 7 are based on 31 stitches, while the triangles #2,3,5 and 6 are 16 stitches. The tiny triangles #8,9,10 and 11 also pick up16 stitches but have been decreased (k2tog) the beginning and ending of every front row. The sleeve sides are then sewn to the center sleeve panel. Pick up 57 stitches along edge of front or back panels. One or two extra stitches are OK, whatever makes it look like every edge stitch is included. Decrease on right sides by k1, k2tog on bottom edge to match the direction of the front or back panel bottom diamond. Carry up contrasting yarn on opposite side. Make four sections, two on each side for sleeves. Sew sleeve sides to sleeve center panel. Collar. Pick up stitches around the square neck opening, using smaller dpns, or a circular needle #8 and a single yarn, join in a circle. For a cowl collar: Knit with a single yarn, alternating one row knit and one row purl. Bind off at desired height. If desired, the collar can be split and knit flat after then initial six rows are knit. To do this, knit six rounds, find center front stitch, turn and knit to end, slipping first stitch of each row. If buttonholes are desired, make a simple one with yo, k2tog. Collar. Pick up stitches around the square neck opening, using smaller dpns, or a circular needle #8 and a single yarn, join in a circle. For a cowl collar: Knit with a single yarn, alternating one row knit and one row purl. Bind off at desired height. 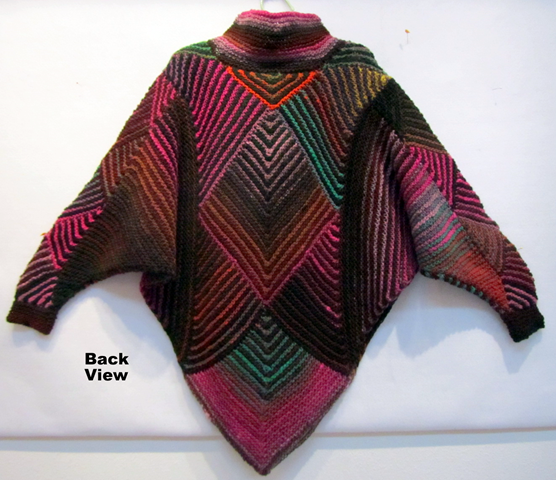 If desired, the collar can be split and knit flat after the initial six rows are knit. To do this, knit six rounds, find center front stitch, turn and knit to end, slipping first stitch of each row, alternating one row knit and one row purl. If buttonholes are desired, make a simple one with yo, k2tog. Optional cuffs. Pick up stitches all around bottom of sleeve and join in a circle. Knit 1 row, Purl 1 row alternately for 12 rows or six ridges, bind off. Blocking really helps this yarn lie flat and drape best. « Без заголовка 3203	» Поздравление с Рождеством Христовым в стихах!